After President Trump’s recent executive order for universities to uphold all forms of free speech on campus or risk losing federal funding, a group of anti-abortion activists from Grand Rapid’s Inner City Church Planting Mission showed up on Grand Valley State University’s campus April 8 to see how officials would respond. The group was directed by David Schutte who had previously demonstrated on the university’s campus. Schutte and his fellow demonstrators initially set up near the Carillon Tower (a designated free speech zone of GVSU), then later left the zone to see if campus police would respond. Police did not interfere. Cannabis is now legal recreationally in Michigan for residents over the age of 21. As citizens and state lawmakers continue to navigate this change in law, the subject of intoxicated driving proves to be one of the biggest discussion points surrounding cannabis legalization. A March 2019 report from the Michigan Impaired Driving Safety Commission (IDSC) actually suggested that a specific threshold should not be set to define drugged driving, akin to the .08 blood alcohol threshold. Instead, officers will essentially have to rely on their training and the use of roadside sobriety tests to determine whether an individual is too high to drive. Student senate introduced a proposal to the Board of Trustees that seeks to improve and foster student participation within the board’s decision making. If accepted by the board, the proposal will seek more opportunities for student input and ideas on board decisions regarding students. 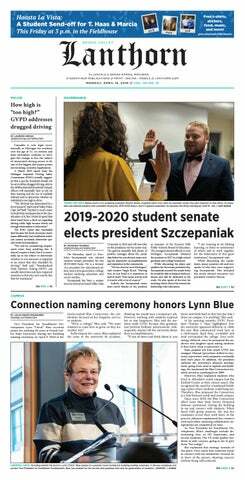 Student senate president Rachel Jenkin, who co-authored the proposal along with incoming president Eric-John Szczepaniak, explained that she sees the proposal to promote the inclusion of more student voices on changes being made at GVSU. Tuesday, April 2 was declared by Gov. Gretchen Whitmer as Equal Pay Day in Michigan. The date symbolizes how far into the next year a woman has to work to earn the same amount of money a man did during the previous year, sparking a national dialogue on the prevalence of the gender wage gap in Michigan and the rest of the United States. The Equal Pay Act was signed by President John F. Kennedy more than half a century ago, yet today, women in Michigan earn .78 cents for every dollar earned by a man. Employers must pay all employees the same salaries for similar work, but the wage gap looks at the overall picture of money earned in a year, not specific workplaces. Causes of the gap have been explored for decades, but more and more studies conclude that women have more unpaid responsibilities than men, so men are spending more of their time getting paid for their efforts than women do. At student senate's general assembly on March 28, the 2019-2020 Student Life Fund (SLF) allocations were approved for over 20 campus councils and events, which is then distributed to almost 400 campus organizations across Grand Valley State University. SLF is compiled of over $1 million from GVSU's general fund and housing and dining. A year after the infamous shooting at her high school in Parkland, Fla., survivor Samantha Fuentes visited Grand Valley State University to provide her story and perspective about gun violence in American schools. On Feb. 27, she sat on a discussion panel with several faculty members from GV’s College of Education. The event titled ‘Safe Learning Environments for our Students’ was held in Loosemore Auditorium on the Pew Campus and explored the various questions of ethical safety in schools. Friday, Feb. 8, Grand Valley State University’s Board of Trustees approved price increases for on-campus housing and meal plans for the 2019-2020 academic year. The unanimous vote increased housing costs by $17 per semester and main meal plan costs by $50 per semester. The total increase was 2.2 percent, a $1.2 million increase overall. The decision by the board was reached following reviews of GVSU’s tuition costs, as well as the costs of facility operations and student employment. Each year, the board addresses the housing and dining rates in February and tuition rates in July. The July date gives the administration time to factor in enrollment numbers for the fall in calculating tuition rates it proposes to trustees. Security is a priority for public and private academic institutes everywhere and Grand Valley State University is no exception. Grand Valley Police Department intends to increase safety measures across the Allendale, Grand Rapids, Muskegon and Holland campuses by adding hundreds of exterior surveillance cameras while also improving the software and infrastructure through which these devices operate. The nearly $3 million project could take up to two years to complete.